Virgin America’s recent declaration that it would acquire six slot pairs at New York LaGuardia airport has fuelled speculation of where those slots will be put to use given the flight restrictions present at the airport. Those caps prohibit direct service to the carrier’s main bases of San Francisco and Los Angeles, so Virgin America must set its sights on mid-con routes such as Chicago O’Hare or perhaps north-south route pairings along the US east coast. A school of thought is also emerging that perhaps Virgin America opportunistically grabbed the slots to trade them for expanded access to other slot-controlled airports such as Newark Liberty or Washington National. Only Virgin America can definitively explain its motives for purchasing the slots from American. But there is one certainty that lingers over discussions regarding potential routes Virgin America will serve from LaGuardia – the carrier will have lots of (not always welcome) company in any route pairing it selects. Virgin America and Southwest recently concluded deals to acquire 34 slots at New York LaGuardia as part of a settlement American and US Airways reached with the US Department of Justice in order to close their merger. Included in that slot pool are 10 slots that Southwest Airlines presently leases from American, so essentially Southwest and Virgin America will each pick up 12 slots at the airport for a total of six slot pairs each. With the slots that Southwest is leasing from American, and others it picked up through its acquisition of AirTran and during ATA’s bankruptcy, Southwest currently serves about seven destinations from LaGuardia (according to schedules in OAG for the week of 9-Dec-2013 to 15-Dec-2015) – Atlanta, Chicago Midway, Denver, Houston Hobby, Milwaukee, Nashville and St. Louis. Southwest’s vast domestic network allows for various options as it works to determine where its additional slots at LaGuardia will generate the most revenue. The carrier recently stated it would start using those extra slots in May-2014, which might temporarily rule out service to its headquarters at Dallas Love Field. 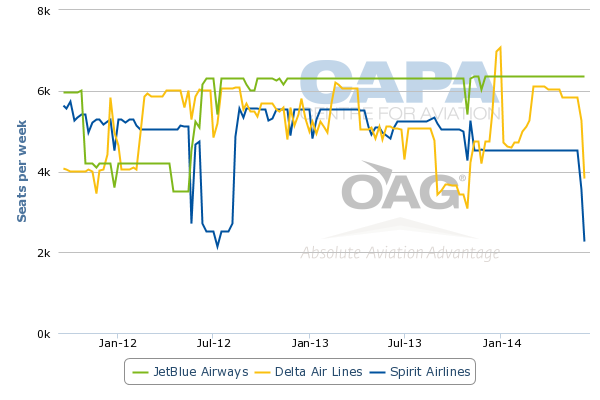 The long-standing Wright Amendment, which only allows aircraft with more than 56-seats to fly direct to markets in nine states, is set to expire in Oct-2014. The carrier already serves four of its top ten markets by departures from LaGuardia – Chicago, Atlanta, Denver and Houston. 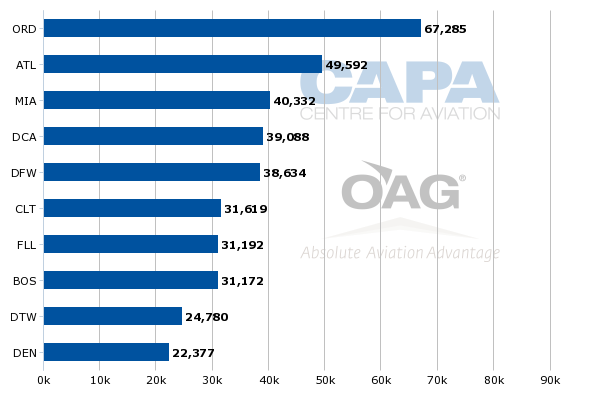 And three of those markets – Chicago (O’Hare), Denver and Atlanta are included in the top domestic markets from LaGuardia with respect to seat deployment. Southwest could obviously use the extra six slot pairs to bolster frequencies in existing markets, or introduce new markets where it believes it can appeal to more cost-conscious business travellers given LaGuardia’s volume of corporate travellers. Southwest also serves markets included in LaGuardia’s top ten by seats deployed from other points in its network including Charlotte, Fort Lauderdale, Boston, Washington National and Detroit. But Delta and US Airways (who has now officially began its merger with American) have shuttle service to Boston and Washington National, which would likely not make those markets as attractive as others for Southwest. 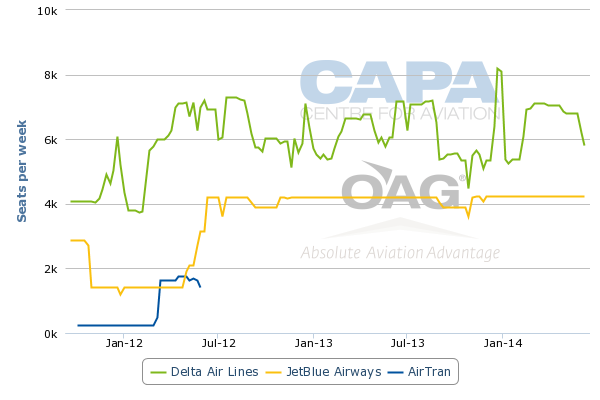 Charlotte and Detroit are hubs for US Airways and Delta, respectively. Even as Southwest competes with those carriers on several routes from those hubs, it seems more logical for Southwest to use the new slots in pockets where it can leverage the most strength, which possibly means more frequencies to its existing markets. It is the largest carrier in terms of seat deployment at Midway, Hobby, Nashville and St Louis, and the second largest carrier in both Denver and Atlanta. But it seems as if Southwest always adds at least one new market from LaGuardia every time it gains access to a few more slot pairs. The specifics regarding Virgin America’s incorporation of LaGuardia into its much smaller network are perhaps more interesting. Once it introduces service from LaGuardia it will serve all three of the New York area’s major airports. JFK was one of its initial markets when it launched service in 2007. It gained access to Newark earlier in 2013 after it reached a deal to lease slots from American Airlines, and launched new service to San Francisco and Los Angeles during Apr-2013. 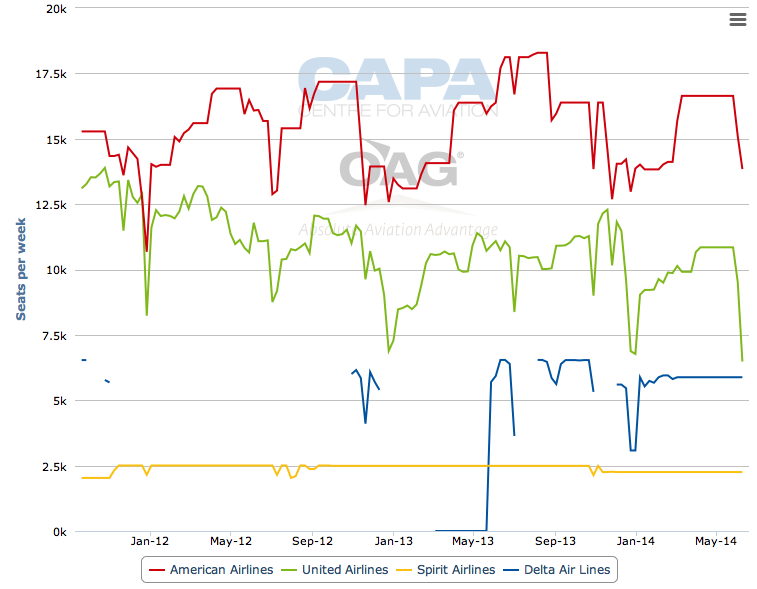 Virgin America broke United’s monopoly status on service to San Francisco, which resulted in United undercutting Virgin America’s fares while also dumping capacity on the pairing. While it may seem illogical for a small carrier like Virgin America to serve all three New York are airports, it business model is largely based on luring business passengers away from other carriers, so blanketing the New York metro area is key. LaGuardia is the closest airport to Manhattan, which makes it strategic for any carrier that seriously caters to the corporate traveller segment. The challenge Virgin America faces in serving LaGuardia is execution. Being stymied from serving its major bases results in the carrier selecting its markets carefully to ensure they attain profitability within a reasonable amount of time. Of Virgin America’s top ten bases in terms of seats deployed, Dallas, Chicago and Washington Dulles all fall within the 1,500nm route restrictions in place at LaGuardia. Presently, Virgin America only serves those markets with direct flights to Los Angeles and San Francisco. 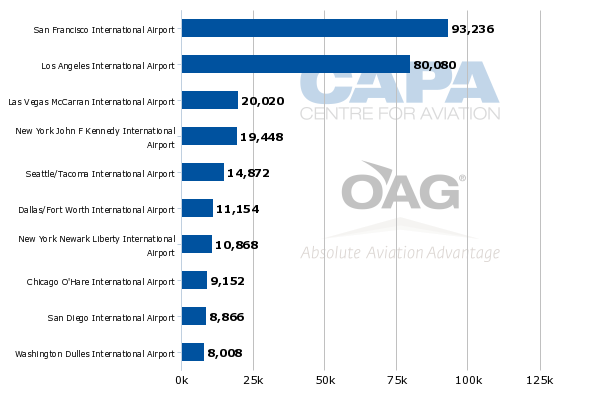 Dallas, Chicago and Washington Reagan are among the top ten at LaGuardia, so those might be potential targets for the carrier, but each of those routes has inherent challenges for new entrants. 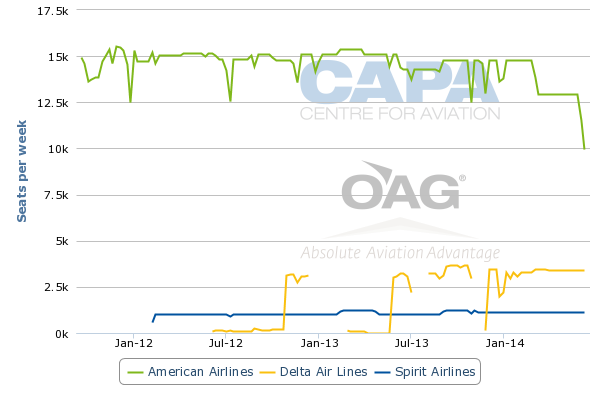 Chicago is an already extremely crowded market, reflected in the approximately, 33,900 one-way seats deployed from LaGuardia to O’Hare by American, Delta, United and Spirit. 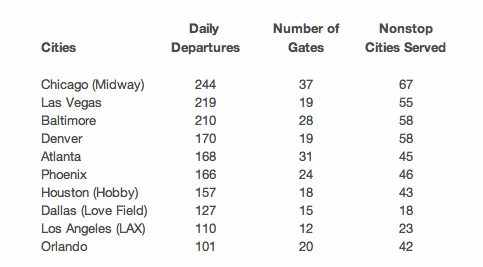 Southwest operates roughly 5,760 flights LaGuardia to Chicago Midway. Virgin America could target connecting passengers through Chicago onwards to San Francisco and Los Angeles, but with just a couple of flights per day it would be tough sell given that United and American offer numerous daily flights in those markets. Even if Virgin America were to use all its slot pairs in Chicago, it still could not compete with United and American on schedules for connecting service. If Virgin America opts to serve Dallas/Forth Worth from LaGuardia, it would join American, Delta and Spirit Airlines in operating the route. DFW could present an opportunity for Virgin America to compete as it can offer a competitive product at presumably a lower price point than American and Delta. It can market a value proposition that falls in between the legacy offering and the bare-bones model incorporated by Spirit. But Delta has tabled its plans to offer service from Dallas Love Field to LaGuardia once the Wright Amendment expires, which will add new competitive layer for Virgin America if its opts to operate to DFW from LaGuardia. If Delta succeeds in launching flights from Love Field, it doesn’t mean the DFW-LaGuardia route cannot be viable for Virgin America, it just results in an another competitive hurdle the much smaller the carrier must overcome. Of course Virgin America has the option to use its LaGuardia slots in markets with a higher leisure bent including Fort Lauderdale and Orlando. The carrier presently serves Orlando from Los Angeles and Fort Lauderdale from San Francisco and Los Angeles. Similar to all the seemingly obvious markets from LaGuardia, those routes are also crowded. Delta, JetBlue and Spirit combined offer nearly 15,600 weekly seats between LaGuardia and Fort Lauderdale, and Delta and JetBlue are deploying almost 9,600 seats from LaGuardia to Orlando. It is plausible that Virgin America could opt to add a new market to its network with the new LaGuardia slots, perhaps Denver. But the carrier has slowed its growth in order to improve its fortunes – it posted its first consecutive quarterly profit from 2Q2013 to 3Q2013 – and the expense of adding a totally new market may, for the moment, make forging new territory unattractive. There is no doubt Virgin America is all too aware that it will face formidable competition in any move it makes from LaGuardia, and many of those competitors are quite familiar to the carrier. Whatever the outcome, it seems Virgin America is preparing for a new chapter in its network evolution that is geared toward connecting the dots from some of its US mid-west and eastern markets with New York. How that chapter ends is anyone’s guess, but in the very short term Virgin America may just start truly living up to its name by fleshing out its largely transcontinental network.